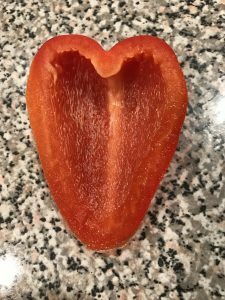 Guys, I ♥️ red bell peppers! So much so that I subconsciously cut one into the shape of a heart prepping dinner the other night. Naturally I had to take a picture once I saw this! Red bell peppers are one of those ingredients that’s just as good raw as it is cooked and has a ton of nutrients. One pepper contains your daily value of vitamins A and C. Unlike a lot of other vegetables peppers hold up really well to being cooked without loosing their nutritional value or texture. 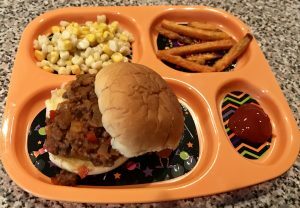 Sloppy Joes was one of my absolute favorite dinners as a kid. It wasn’t until I became a mom myself that I started looking more into what exactly is in that can mix. Turns out, a lot of sugar. After many, many, many, failed attempts I’ve finally created a recipe that’s both yummy and healthier for you. The sauce does still call for some sugar, but I really bring in a lot of natural sweetness with red bell pepper and carrots. Also beefing up the recipe with so many veggies means you can actually get away with using less beef, which is budget friendly also! In a large skillet brown your meat over medium heat with some salt, garlic and onion powder. Once cooked through add your peppers, onions, carrots and garlic. Cook 10 minutes. 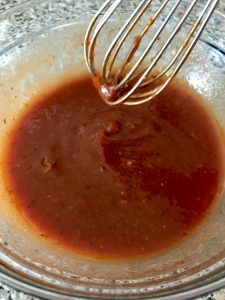 Mix together the remaining ingredients (Tomato sauce, ketchup, brown sugar, Worcestershire, mustard and vinegar) in a bowl until combined. Pour sauce over meat and veggie mixture, bring to a slight boil, then simmer 20 minutes. Taste and salt and pepper if needed. 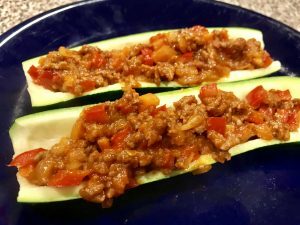 Serve hot on buns or in steamed zucchini boats for a low carb option. 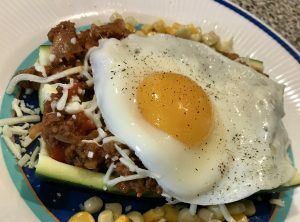 If you are looking for more to add on Keto I suggest topping your sloppy joe filled zucchini boats with cheese and a fried egg, you’ll add more protein and make the dish more filling without adding any carbs! 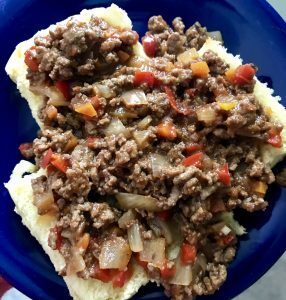 My personal favorite way to eat Sloppy Joe’s is open face, less bun = more filling! My biggest tip for this recipe is to double it!! It keeps in the fridge or freezer beautifully. My recipe feeds 4 with sides so if you’re super hungry doubling it is also a good option. 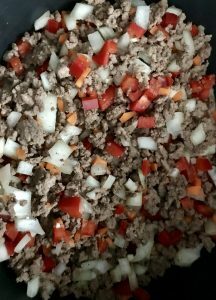 I very often brown the meat ahead of time and throw in the veggies raw with the sauce in the crock pot on high 3 hours or low 6. You could also use the instant pot and brown the meat right in there for a one pot option. I find the longer it cooks the more the flavors blend and the yummier it becomes. 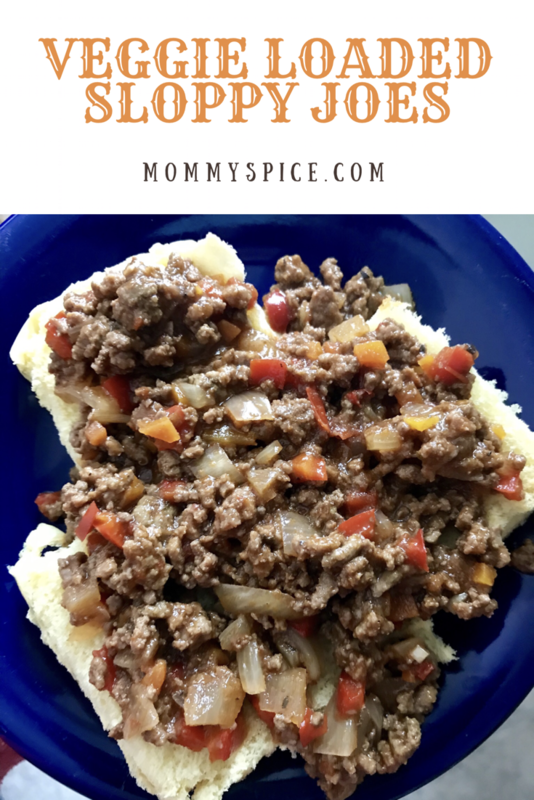 This is one versatile dish that’s kid friendly and now loaded with veggies!